Plantains are from the same family as bananas. Plantains are a starchy, low-sugar fruit and are used more like a potato. The outer skin is very thick and difficult to peel when the fruit is unripe. Plantains are eaten around the world but are most popular in Latin America and West Africa, where they are a staple. Peel the plantains and cut them into 1-inch thick disks. Place the garlic in a bowl with the water and set aside. Heat enough oil in a large skillet so that the disks will be half way submerged in the oil. When the oil is shiny and a drop of water sizzles across the top, add the plantains. Fry for 3-5 minutes on each side until the plantains are lightly softened and browned. Remove and place on a paper towel lined plate. Place the plantains on a cutting board, smash with the back of a wooden spoon to make them half as thick, and let them soak in the garlic water for about a minute. Remove, dry and wipe off garlic pieces so they don’t burn, and return to the frying pan. Fry for another 2-3 minutes on each side or until they take on a deep golden color and a crispy texture. Drain again on paper towels, sprinkle with ground sea salt, and serve with rice, beans and optional herbs like cilantro. Choose plantains that are firm and mostly green. The yellow and black ones are sweeter, which is also good and is usually called “Fried Ripe Plantains”. 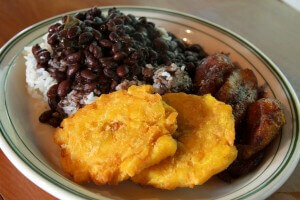 You can basically use any kind of rice and beans and just add whatever fresh vegetables and herbs you have available.